I haven’t conducted a definitive, scientific study, but it seems to me that I have more women — you know, people of the female persuasion — who read and comment on my blog than men. That made me curious to know if there are, in general, more female bloggers than male bloggers. Or if there’s something specific about my blog that attracts more females than males. So I Googled “Blogger genders,” and came across this handy-dandy pie chart: The chart suggests that blogging is pretty much gender neutral, with only an ever so slight edge going to females. Of course, this survey was conducted a while ago, and, you know, feminism and all that. Maybe I’m wrong. Maybe my blog doesn’t really have more female readers than male readers. Maybe it’s just my imagination. Or wishful thinking. No poll necessary for my blog. My readership is so skinny that one vote one way or the other would skew results by about “100%”. As for myself, at least as to online activities, I’ve identified as male, female, gay, lesbian, white, black, brown, euro, asian, trans, undefined, neutral, native, and on one memorable occasion as a conflicted bisexual lizard from the Draco constellation over on a UFO site (conflicted as to what we were doing with humans, not my sexuality, you understand). So really I suppose you could consider my gender/racial makeup as being “fluid”, which is to say, not defined by genitalia, DNA, or the fascist strictures demanded by the rigid labels of Church and State, but rather in my inherent human right and freedom to choose based totally on whatever persona seems to annoy people the most that day. It seems like you covered all of the possibilities with I am not sure, I am in transition, I don’t know and I don’t care, It’s none of your business and What? You have to ask? I’ve never been so insulted in my entire life! Is it terribly difficult to create one of these voting polls, as I may need to do that for the new challenge that I am hosting? Not difficult at all. 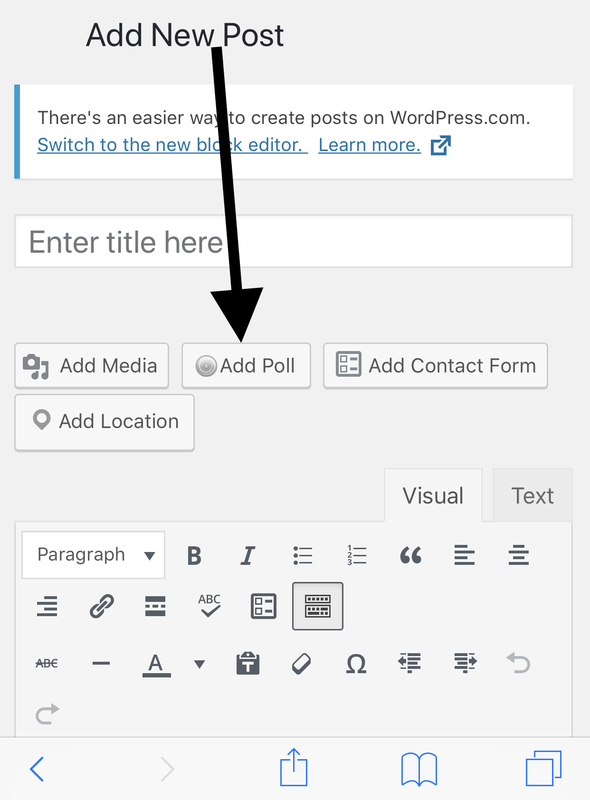 Just go to “Add Post” and when you want to add a poll to your post, just click on “Add Poll” in the Editor as shown below. Thanks for the wonderful instructions. I am going to be the host of the Mindlovemisery’s Menagerie Music Challenges and I may need to make a poll. Hey, good for you, Jim. You are all about music these days! I voted as a female but the last option was attractive too. You never know for sure! That last option was very attractive, but I’m female and not ashamed of it either. Long ago, in forum world, I learned (by experience) not to use a name that was male or female (or even, for a while, include content that would identify such). There was a lot of abusive attitude toward women (I found this surprising). Then the misogynists had to explicitly ask or hint around about my gender not being “out there” before feeling freed to savage me. You forgot Russian Internet Bot on your poll, although they would probably just lie and pick another category. I have just read the comments from other bloggers and now I am nervous about the poll. But is it really surprising that there are more communicative female bloggers. There are some male bloggers who comment regularly on my site, but the vast majority are female. I think women on the whole do like to communicate. “ I think women on the whole do like to communicate.” Versus us male, strong, silent types!